An Economist, Dr. Ebo Turkson has strongly advised against lifting the ban on public sector employment following the country's exit from the International Monetary Fund (IMF) programme. As part of the program, all recruitments into the public sector were frozen in an effort to manage what was then said to be a bloated public sector wage bill. There were however waivers for essential recruitments. Following the official announcement of the country's exit from the programme, the Economist said Ghana must instil the discipline learned and maintain the gains made. “We need to stick to the discipline, the cap on public sector employment should not be removed, we replace when others are going on retirement than employ into the public sector. We don't need to increase the number of men and women working in the sector. In 2014, before we went to the IMF our wage bill was taking almost 53% percent of our domestic revenue. Over time, we have been able to reduce it to 43% which is still very high. We expect it to be 30% of domestic revenue,” he said. Meanwhile, Dr. Kobina Otoo, Research Director of the Trade Unions Congress (TUC) has said the ban must be reversed. But critics maintain that the human resource shortages in the public sector must be immediately addressed, arguing that the bloats in the public wage bill cannot be solely blamed on the workforce. “There is still a shortage of teachers, there is still a shortage of nurses there are still shortages of cleaners for purposes of sanitation. In some of these areas, you cannot expect the private sector to employ them. So the state must be able to employ people in order to give quality public service. We have always thought the IMF ban on recruitment into the public sector was a mistake in the first place. Now that the IMF is not here, the government must do the right thing and employ people to give quality service,” he noted. “The wage bill has been a problem for the government but is not so much about the wages and salary. The average bill in the public sector is around a 1000 cedis. So to think that every problem government is due to the public sector wage bill is not true. There are important challenges within the way the state manages its physical policies that need to be addressed,” Dr. Kobina Otoo added. 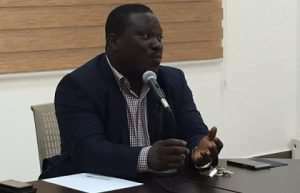 The Member of Parliament for Bolgatanga Central, Isaac Adongo had earlier insisted that Ghana exited the International Monetary Fund (IMF) programme without achieving its objectives. “The IMF at a point got fed up with us. We had come to a point where we have left the IMF without achieving the objectives of the IMF programme. As a matter of fact, the IMF at a point got tired of us…The risk of it all is that the managers of the economy do not seem to know where we are and that is a bigger problem,” Mr. Adongo said at the NDC’s public lecture on the economy on Thursday. The Vice President, Mohamadu Bawumia confirmed that Ghana’s officially exited the IMF's extended credit facility arrangement on Tuesday, April 2, 2019.